Every year Gandhinagar Institute of Technology organizes Tech-Xtreme: A National level technical festival, at its lush green campus of GIT. It comprises of more than 50 events which are from the various fields including Engineering, Management, Pharmacy, Architecture, Computer Science and many more. Various competitions motivate the students to bring out their inner skills.The motive behind the TechFest is to demonstrate how technology can be imparted in society via various interesting ways. Since beginning this festival becomes proud moments for GIT where students show their technical abilities to prove how good it is and gets awarded and appreciated. Various competitions related to the Robotics, Dirt Rush GT (Robo- race Event) and Robo-puzzle are also major attractions in which robots perform tedious tasks. Search Spider (event based on Google hunt), Walk on Fire (event based on Laser light), Bomb Diffuser (based on Circuit Design Concepts), event based on theme of re-use of waste water, Pharma Recipe (Stereo Pharma Model competition), Corpoquiz (Business Quiz), Concourse De Design (Cad Competition) Computer Programming, Electronic Circuit designing, Design of suspension bridge, Pharma model making, Patent track, Open source software event, event based on design of Earthquake resistant structure and business plan competition are among a few of its major attractions.Cash prizes of more than Rs 1 lakh and Certificates are distributed to the winners in the grand valedictory. Workshops on different subjects and emerging topics have also been organized during these two days with a great support from the Industries for the participants to have latest know how in today’s industrial economy. It also helps them to expand their knowledge to industry level and standards and beyond that to make one’s life easier which is any engineer’s motto. Gandhinagar Institute of Technology, managed by Platinum Foundation, celebrates its grand gala annual cultural festival JAZBA. It showcases more than fifteen events including Antakshari, Quiz, Rangoli, Debate, T-shirt Painting, Singing, Dancing, Skit, Mr & Miss GIT, Face Painting, Cooking, Sand Art, Bhookhad, Laggy Cricket and many more. The day events are followed by musical evening program in which multi-talented students from various branches perform in various events like Skit, Solo & Duet Singing, Solo & Group Dance etc. Actress from movie and television industry are invited to inspire the students for culture and co-curricular activities. Ms. Sonal Chauhan (Jannat Movie Actreess), Mr. Ranvijay Singh (Actor and MTV Roadies Host), Hard Kaur (Singer, Rapper and Musician), Mr. Rajdeep Chatrerjee(Indion Idol Fame Singer) and many more become a part of this grand event. 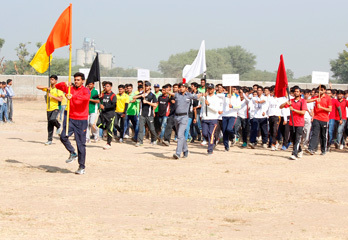 Every year The Annual Sports Meet is organized at the College Campus. Students and Faculties are at their harmony to organize panoramic activities related to sports events. Gandhinagar Institute of Technology has formed a “Sports Committee” for bringing out talent in students and giving them a platform to perform in sports events organized by college, other colleges and GTU which is helpful for overall development of students physically and mentally. It also used to increase levels of discipline and sportsman spirit. The whole event is organized not only inside the GIT Campus, but also at some prime Sports locations of Gujarat State. There are 8 sports activities conducted (4 outdoor & 4 indoor) where more then 600+ players in cricket, 400+ players in Volleyball, 250+ players in Kabbadi, 600+ players in badminton, 350+ players in Carom, 150+ players in Table-Tennis and 180+ players in Chess, participates in the competition every year. Teaching a sense of culture and unity is the spirit of any Indian festival and Navratri is a portrayal of color, action, music and devotedness. The Navratri celebration is devoted to the worship of the Eternal mother which has its origins in the Vedas. Durga is also considered to be a combination of the Trinity of goddesses- Saraswati, Parvati, and Lakshmi. During Navratri, these three main goddesses are worshipped as well. Students along with staff dressed in colorful traditional Gujarati costume performed Raas and Garba. Youthful students and faculty members of the Institute perform in this grand gala Annual Garba Event. 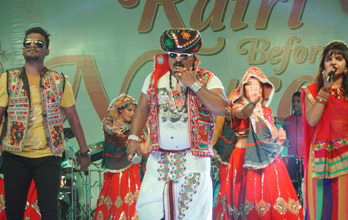 Mr. Arvind Vegda, the singer of BHAI BHAI was the star attraction of last Navratri night. Every year, Prizes are given to the winners of various categories including best costume, best solo dance, best group dance etc. Huge Media coverage is attained during the Garba Night. was established in 1905 with the founding principle to unite scientific and technical staff to perform free academic discussions, to dedicate themselves for the cause of prospering the science and technology for automotive vehicles and to make contributions to speed up the modernization of automotive industry. An SAEINDIA Collegiate Club is the best gift a college management can give to its students of Mechanical Engineering Department. The society of automotive engineers at Gandhinagar Institute of Technology ventures to promote extensive engineering, designing skills and fabrication dedicated to create innovative solutions and advanced technologies in the field of Automobile An SAEINDIA Collegiate Club imparts a framework to the creativity and scientific thirst of students by providing avenues to students to solve engineering problems of real nature, learn to manage projects in a collaborative environment and keep themselves abreast with the latest in mobility engineering. The team Renosters (of GIT) is under the guidance of proactive faculty advisors, with the support of Gandhinagar Institute of Technology in the form of complete laboratory/workshop facilities and technical assistance to design and fabricate All-Terrain Vehicle (ATV). The primary objective of the team was to learn the skills required for designing and fabricating an ATV that meets the legislation, safe, comfortable, inexpensive and aesthetically appealing. Team Renosters, comprising 21 members, participated in the off road vehicle collegiate event “Baja Student India” of Delta Inc. Baja Student India is a national level undergraduate engineering event wherein the students are expected to replicate a real-life scenario Design, Analyze & Fabricate a single seater, 4 wheeled All-Terrain Vehicle which was then raced in the specially created track near National Institute of Technology (NIT), Jamshedpur. 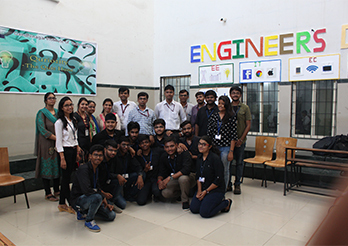 Team qualified in the event with their quiz competition (second phase) in August 2014 from a crowd of 66 teams from all over India, receiving the go-ahead to fabricate the model of the same with 6th rank position overall. The main event was held at National Institute of Technology (NIT), Jamshedpur schedule from 7th to 11th January, 2015. Student teams are judged based on Static events, written technical test, presentations and design evaluations, ergonomics, functionality, and productivity of their ATV; and also the dynamic events like acceleration, braking, hill climbs, chain pulls, maneuverability, and a gruesome 4 hour endurance race in the final event. GIT secured 20th position among 42 teams at National Level. The Mechanical engineering department’s students have already started development and training for the next year’s BAJA SAEINDIA ATV competition which is going to be held at Chandigarh in July 2015. The Indian Society of Heating, Refrigerating and Air Conditioning Engineers (ISHRAE), was founded in 1981 at New Delhi by a group of eminent HVAC&R professionals. ISHRAE today has more than 10,000 HVAC&R professionals and 3,000 students as members with 40 chapters and sub chapters across India. ISHRAE’s primary objective is the advancement of the art and sciences of Heating, Ventilation, Air Conditioning, Refrigeration Engineering & other related Building Services. ISHRAE engages in a broad spectrum of activities to attain its objectives. 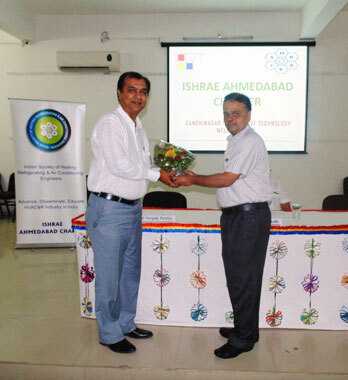 On 18th October 2014, there was an official Inaugural Function of ISHRAE Student chapter at GIT by ISHRAE Ahmedabad chapter and from then GIT is actively involved with all activities of ISHRAE. ISHRAE Provides excellent networking opportunities to interact with other Professionals, Industry Leaders and key Decisions Makers in the Profession and Industry. It provides an excellent forum for Professional Development and continuous Training & Re‐Training on both fundamentals and latest products and technologies available worldwide. It also provides a platform for effective marketing and launching of new products and technologies through exhibitions, product presentations and advertisements and an International exposure through ASHRAE (American Society with 50,000 members association ‐ our International Associate Easy access to all ISHRAE Technical Publications, Software’s, Workshops and Training Programs Opportunity to work in the Chapter Working Committee towards our mission to promote the arts and sciences of HVAC&R in India. GTU has introduced Open Source Technology Club initiative for all the GTU affiliated colleges in collaboration with Spoken Tutorial Project-IIT Bombay. To take the benefit of this opportunity, Gandhinagar Institute of Technology has established Open Source Technologies Club (OSTC). The Spoken Tutorial Project is about teaching and learning a particular FOSS (Free and Open Source Software) like Linux, Scilab, LaTeX, PHP & MySQL, Java, C/C++, Libre Office, Inkspace, Net Beans, Libre Office Suit, Python, PHP, Scilab and many more via an easy Video tool – Spoken Tutorials. Today, SMEs and Govt. departments are moving to Open Source Software like Linux OS. Students with this knowledge will have an edge in the job market. They can also become entrepreneurs and use Open Source Software in their businesses and save money vs if they use commercial software. Net – it is a win-win situation for all and the best part, all the Trainings are conducted FREE of cost. The training has been started in July 2011 and to date around 1500+ participants took advantage of this club and certified. 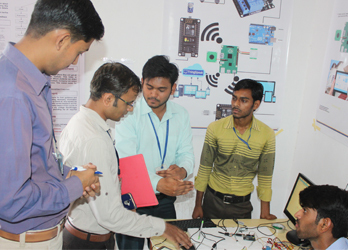 GIT MWTC (Mobile & Wireless Technology Club) is engaged and promoting many more projects and activities related with the field of Wireless Communications, Mobile Computing, Web Content Development, Android Applications Development etc. Recently “GIT App” was developed & launched by the final year students of Computer Engineering which provides all the useful information related to Gandhinagar Institute of Technology. One more application that provides detailed Weather Information has also been developed. Two days’ Workshop on Android Application Development has also been organized and a great number of students from EC/CE/IT branch participate in the workshop. Several informative sessions, Talk shows, and project related with website development, cloud computing, etc. are also in the pipeline. MWTC @ GIT works actively with Mobile Monday Club. As part of its social responsibility, GIT regularly conducts various youthful activities. 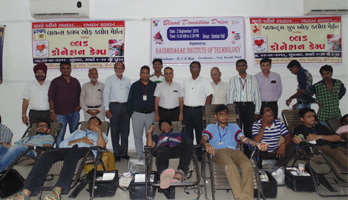 Keeping this tradition alive, every year major Blood Donation Drives have been organized at the Institute premises in association with Civil Hospital; Ahmedabad and Lions Club; Kalol and Giants Group; Kalol. Chief Coordinator Dr N M Bhatt motivates GIT fraternity with a brief speech which emphasized the importance of Blood Donation activity for a healthy society and a healthy nation. GIT has been considered as the best engineering college as it got the award from GTU as an outstanding blood donor in past years. Stimulated gathering started the Drive and a total of 150 and 179 units of blood were donated respectively and in future it will keep this tradition alive and inspire youth for their social responsibilities. Women Safety Security Day for women has been celebrated at GIT under Surksha Setu Society. A training was organized on 7th October 2014 at Police headquarters, Shahibaug by Surksha Setu Society. In this session girls were given all materials for organizing the program such as banner of 1091 Police Heart, pamphlets of 1091, IPC laws, momento, t-shirt, bands, cap etc. In training session they had shown some videos related to the program which focused on awareness about the laws and services which have been made for females by Indian government so that they can take immediate action against any incident. 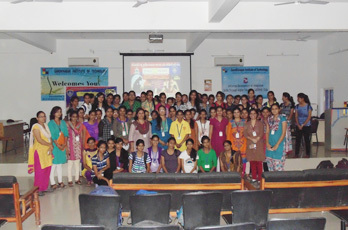 On 9th October 2014 the program was conducted at GIT where around 75 girls and 10 female faculty members had attended it. Motive of this program was to aware female students and faculties of the college about various laws, services from the police, rights against women crime and emergency self-defense techniques and from then this program takes part in equal duration for women empowerment and safety. Yoga was originated in India in ancient time when people used meditation as a means to purify and rejuvenate the body and mind. Yoga is an invaluable gift of India’s ancient tradition. United Nations General Assembly has declared, 21st June as an International Yoga Day in 2014 and it is a matter of pride and joy for India that under the visionary leadership of Hon. Prime Minister Shri Narendra Modi, this day has been celebrated as International Yoga Day. 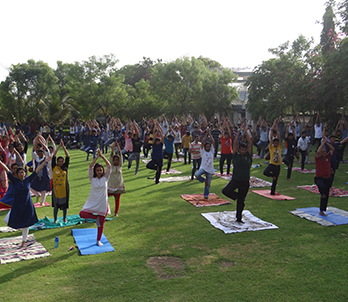 Every year Gandhinagar Institute of Technology celebrates International Yoga Day on 21stJune in which a number of activities take place with the immense support of Students and Teaching and Non-teaching Staff of the College. The Yoga Demonstration, in which a large number of students, teaching and non-teaching staff participates. Students and staff perform Pranayama, Omkar Chanting, Breathing Exercise, Surya namaskar, and several Standing and seating Asanas. Students and staff reckon many benefits of early rising and practicing yoga. Speaking to the assembly they also pointed out the contribution of yoga in maintaining fitness and good health and how it helps students to memorize something and understand a concept and its context. Yoga is the scientific way of living healthy and increasing life expectancy. Cycling is a lot more than a sport-on-wheels when the surroundings go euphoric with the enthusiastic participants, colorful cycles and the passionate riders who exhibit their love for mother nature with the motto of the event ‘GO GREEN’ & ‘STOP POLLUTION’. It is a platform to enhance sporting skills along with the routine life. 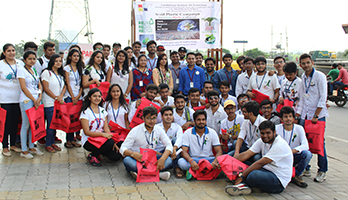 To instigate the awareness for clean and green city and to inspire the citizen of the city for good health and fitness, Gandhinagar Institute of Technology had organizes cycling event called Cyclothon at Sardar Bridge Riverfront every year. The participants had cycles 12km with full of joy in pleasant environment on the bank of Sabarmati. 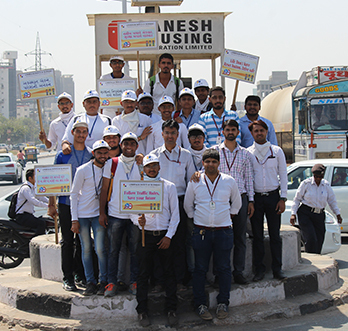 “Traffic Awareness Programme” is organized by Gandhinagar Institute of Technology at various places of Ahmedabad for awareness regarding road safety and traffic rules among the citizens. More than one lakh people lost their lives every year in India due to road accidents. An attempt has been made in order to highlight and emphasize the need for road safety. Students were communicated the fundamental knowledge of traffic rules and road safety among the citizens via using banners, play cards, slogans and helping the traffic police to manage the traffic at various circles and cross roads. During the event, students tried to convince citizens to follow the traffic signals and avoid over speeding of vehicles to save themselves and others from any road casualty. With kind cooperation of traffic police, citizens were persuaded to use pedestrian crossing across the flow of vehicular traffic for safe crossing. The most important part of the event was that the students conveyed a very strong and clear message to each citizen the importance of traffic rules for their own safety, to avoid road accidents and to save the valuable human lives. The students prepared various attractive placards and slogans to convey the message of traffic awareness in the society. Such event will help the students to become more responsible and disciplined citizen of India. Diabetes has been increasing at a rate of 30 million patients every year. By the medium of Walkathon, Gandhinagar Institute of Technology stands with Diabetic patients and raise awareness about diabetes among students and society. The event was started from Vallabh Sadan towards Sabarmati Riverfront Walkway to Dadhichi Bridge. The event ended at Vallabh Sadan. Total 5.6 km distance was covered by the participants. India is a multi cultural country and festivals are celebrated in India with great zeal. The Kite Festival-Makar Sankranti- Uttarayana is also one of the biggest festivals celebrated in some states of India including Gujarat, which indicates the beginning of the sun’s transition into the zodiac of Capricorn (Makar-Capricorn, Sankranti- transition). 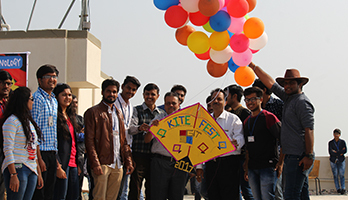 Gandhinagar Institute of Technology celebrates the Kite Flying Festival to enhance the qualities like keenness and energy among students and faculty members of the institute. National Fire Service Day/Week (NSW) is celebrated every year in India from 14th April to 20th April. This is in remembrance of the lives lost in the devastating fire that erupted and the explosions that followed on 14th April, 1944 at the Victoria Dock in the Bombay Port and also to prevent fire in all industries. GIT observed this day as Fire Service day and conducted training, drills and rehearsals to demonstrate the preparedness to combat emergencies. 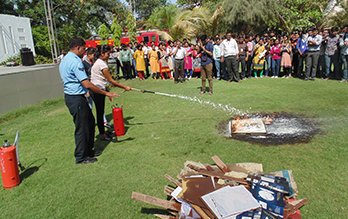 The air force officer gave knowledge of four different types of fire safety appliances and demonstrated the function of fire bridged. To overcome the fear of fire, he involved students, especially females to extinguish fire during the time of emergency. He explained the destructive potential of fire and need for fire prevention efforts. He also solved the queries of the students and faculty members they face in their real life. 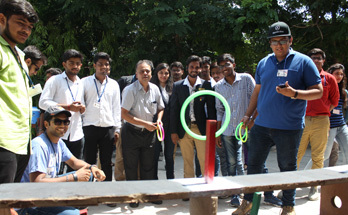 The “Healthy Campus Committee” of Gandhinagar Institute of Technology celebrated ‘International Day against Drug Abuse and Illicit trafficking’ to raise awareness about drug abuse among students and to highlight the threat that drugs pose to our society. 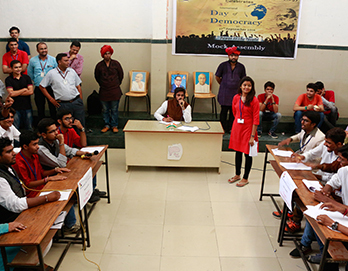 As a part of the event, activities like ‘Poster Making Competition’ and ‘Short Plays’ were organized. A play on an addict student was powerfully scripted and executed by the students. They also carried placards bearing messages of drug abuse to show their support for the movement. 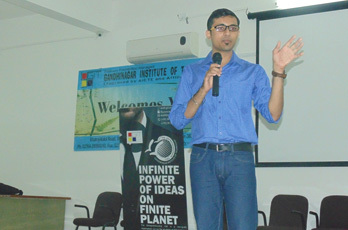 The Healthy Campus Committee (HCC) of Gandhinagar Institute of Technology organizes ‘Cancer Awareness Programme’. Students from various institutes participated in this event. In the morning session, events like ‘Critical Thinking’, ‘Graffiti’ and ‘Just a Minute’ were organized. Critical Thinking, wherein the students presented their creative ideas on varied topics. Graffiti provided students an opportunity to paint their innovative ideas on cancer awareness theme through sketches and paintings on the wall. The students performed various tasks related to fitness and sports in ‘Just a Minute’ event. 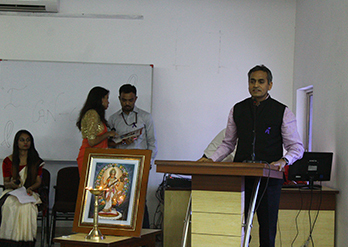 Shri Hari Om Gandhi, Zonal Director, NCB, was the chief guest of the event. 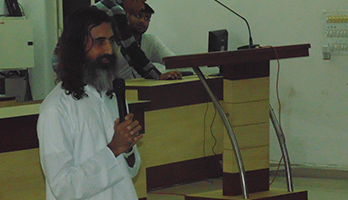 He motivated students to stay healthy and shared his noble views on cancer awareness and its prevention. Dr. Parimal Jivrajani, a consultant in Preventive Oncology at Apollo Hospitals, Ahmedabad took a seminar on cancer awareness. All the guests and participating institutes were felicitated with mementos for their keen participation in the cancer awareness drive. The Avoid Plastic Campaign was planned keeping in mind the moral responsibility of an individual i.e. to protect flora and fauna and to clean up the earth on which we live. It was a step ahead towards saving the nature and the earth, the only planet of our solar system on which life exists with incredible biodiversity and making it beautiful for our upcoming generation. “Avoid Plastic Campaign” organized at ST Bus Depot and D-MART Ranip, to create awareness among the people that how hazardous the plastic is for us and the environment. The engineering community across India celebrates Engineer’s Day on 15thSeptember every year. It is observed in the memory and honour of the greatest Indian engineer Shri Mokshagundam Visvesvaraya. Gandhinagar Institute of Technology celebrated this remarkable day in order to give tribute and respect to this pre-eminent engineer of India. Technical events were organised for the celebration of engineer’s day. Two major technical events were organized namely Quriozity(The Quiz Hunt) and Poster/Model Making(An Art of Abhiyanta). An overwhelming response was received from the students of the institute leading to more than 250 registrations. In 2007 the United Nations General Assembly resolved to observe 15 September as the International Day of Democracy with the purpose of promoting and upholding the principles of democracy and invited all member states and organizations to commemorate the day in an appropriate manner that contributes to raising public awareness. The objective of this event was to impart knowledge on democracy and politics under the global realm to the students and to elucidate its importance; as it provides the natural environment for protection and effective realization of human rights. The event was followed by a Quiz Competition and Mock Assembly in which participants were given five different topics in advance. The students who took part in Mock Assembly were full of zeal and were justifying their points in a dynamic way. The session ended with the vote of thanks followed by the national anthem, which itself is an example of democratic structure of India to pay tribute to all the freedom fighters that fought courageously so that we can enjoy freedom and democracy. The salute is the highest form of respect that the Armed Forces can display. When the tank lowers it’s cannon while passing in front of the President’s dias, it is saluting the supreme commander of the Armed Forces. But did you know that the Indian Army, Navy and Air Force have different salutes that have evolved over time and are steeped in tradition? 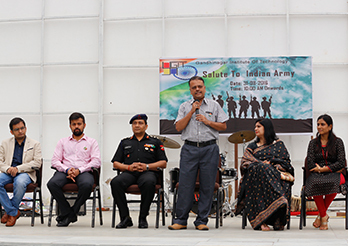 The objective of this event was to honour the dedicated efforts of Indian soldiers who serve the nation. A march past, conducted by the students, marked the beginning of the event which was then followed by varied cultural events such as skit, dancing, singing and instrumental music. The common thread of patriotism charged the environment. This is a campaign by the Government of India to clean the streets, roads and infrastructure of the country’s 4,041 statutory cities and towns. The objectives of Swachh Bharat are to reduce or eliminate open defecation through the construction of individual, cluster and community toilets. 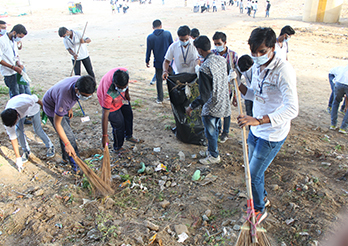 The aim of event is to spread a noble message of making clean India among more and more number of people. The students also prepared humorous and catchy banners to convey message of keeping our society clean and healthy. This event will help students to become responsible citizen of India and will make our dream of clean India come true.